Recommend watching the video footage linked to below. Apologies if you have already seen it. It shows our eminent treasurer leading student protests in 1987 against the imposition of an annual fee upon tertiary students that was quite small relative to the burden being proposed in the current budget. 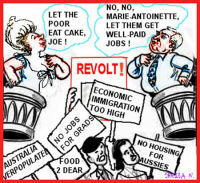 Hockey goes Marie-Antoinette on Entitlement: We need a code of civil rights! It is said that Marie Antoinette, wife of King Louis XVI, when confronted with the fact that people had no bread, said, "Let them eat cake, then." This story is supposed to illustrate how out of touch Marie-Antoinette was - so much so that she could not see the absurdity of her pronouncement - which was that she was rich but the people were starving. Australia has a whole slew of Marie-Antoinettesque politicians who peddle fundamentalist global economic policies, apparently with no idea at all of how angry people are becoming about being treated like children with no rights to self-government at all. Read more about Hockey goes Marie-Antoinette on Entitlement: We need a code of civil rights! Is the "Asian Century" is about downgrading our lifestyles to those of the third-world standards of their teaming and overpopulated cities?